On Saturday 10.9. was the funeral of Outi Savonlahti. 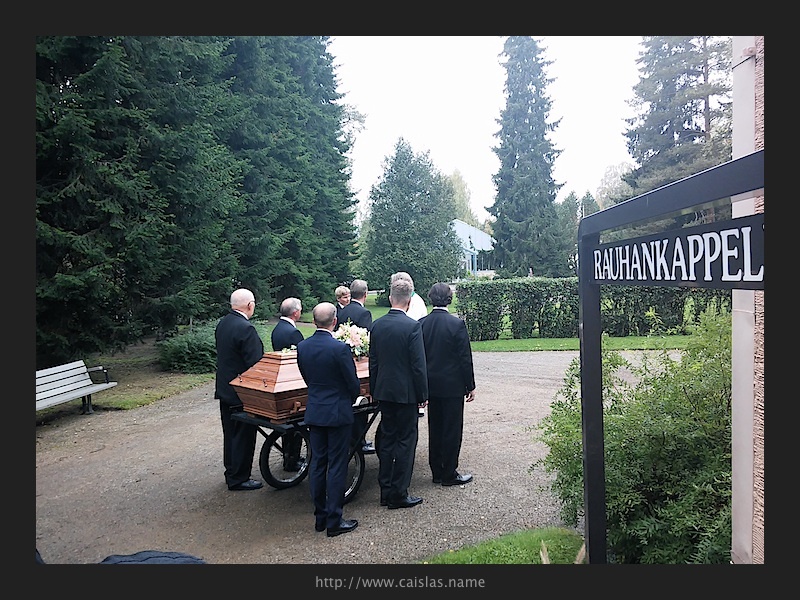 This was the first funeral I joined in Finland. This post’s objective is to briefly share my experience of this ceremony. There are two main motivators for this: (i) Outi was at charge of international affairs at UEF, and she always explained us things about Finland, (ii) it let me a lot food for the though. 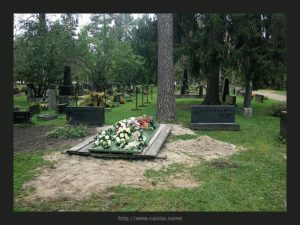 In Finland once someone passes away is not buried right away. As far as I understand, there might be weeks in between from the moment someone dies and her/his funeral . 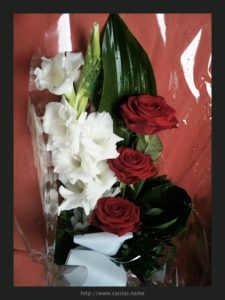 During these weeks relatives, friends and others are informed of the particular person passing away, and the necessary arrangements for the funeral are prepared. For example Outi passed away on August 9th but her funeral was until September 10th . 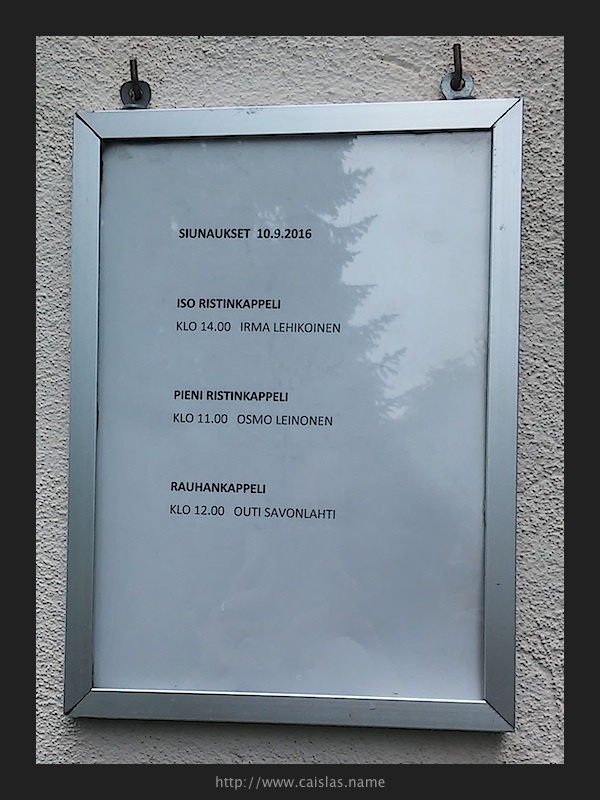 Outi’s funeral started at 12:00 at the Rauhankappeli, which it is located inside Joensuu’s graveyard. We started with the religious service with the coffin present. Family, friends and colleges join the “event”. 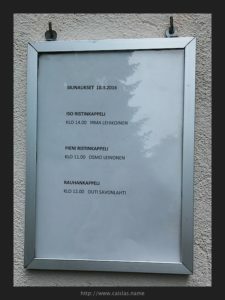 I assume the procedure of the service was according the Lutheran church, however I did not asked this particular detail to anyone. The priest started the ceremony with some words for the audience. Next, each one of participants who brought flowers gave them to Outi. If we had written something or we wanted to say something loudly this was the moment to do it. This process is not done in a rush, instead it is harmonious movement of people standing spontaneously, paying respects and getting back to their sits. 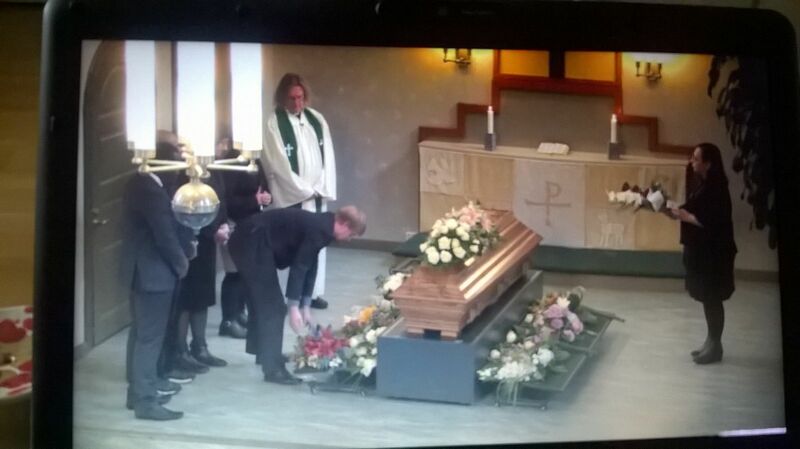 I interpreted this moment as offering our respects to her as each one says a personalize good bye, as close a possible to her earthly representation. Screenshot when I pay my respects to Outi. Once all the flowers were surrounding Outi, I assume the traditional service started. That is, reading fragments of the bible followed by the priest’s homily. Finnish, English and French were present during the service and during the whole ceremony. 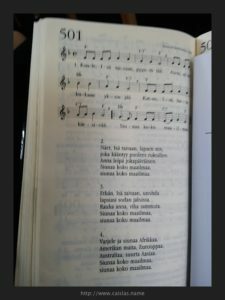 The liturgy had particular moments with music, in some moments we also sang specific pieces. Everybody new the selected songs due to the program that we were given. Additionally, on the chapel’s wall was indicated the song’s numbers and on each chair of the chapel had a book with the song’s lyrics. I particularly liked a song which in this occasion included some African drums. I must say that a lot of religions songs in Finland, as far as I had been exposed to, are not particularly happy. 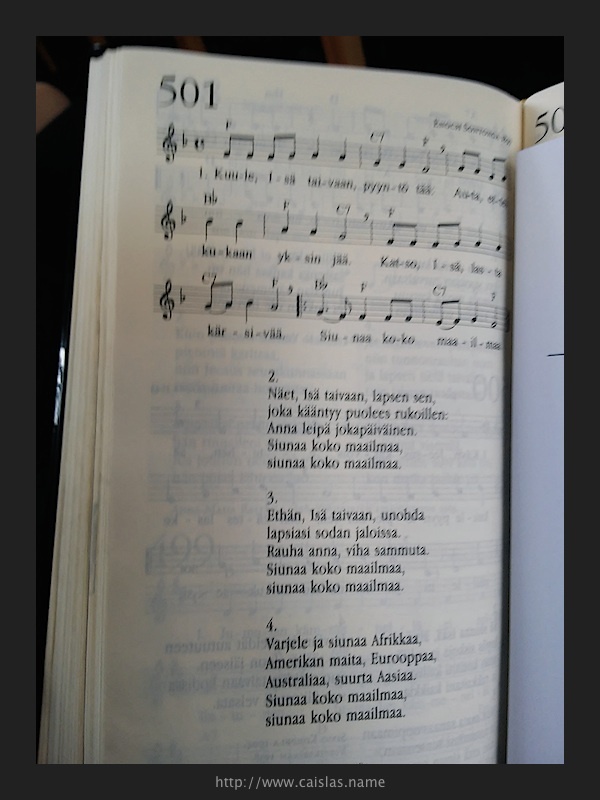 In my opinion – as a Mexican who has been involved in music during my past including religions songs, our church has a lot of happy songs – and in Finland the melodies are more kind of melancholic and nostalgic, so with this little twist of adding African rhythm all changed. At the end of the liturgy the priest indicated us to pick up our flowers, so we can bring them with us and deposit them to the final destination. 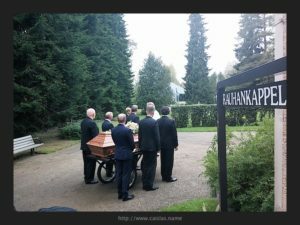 Right after the coffin was without flowers, a group of gentlemen came at front and pick up the coffin to carry it out. Then all the participants followed and the funeral procession started. Once in the location where Outi was buried the priest offered some words. The coffin was deposited and if someone wanted, it was the possibility to take some sand and place it inside the “hole”. Afterwards, a cover was put above and we were invited to locate our flowers there. Location where the body of Outi rests. 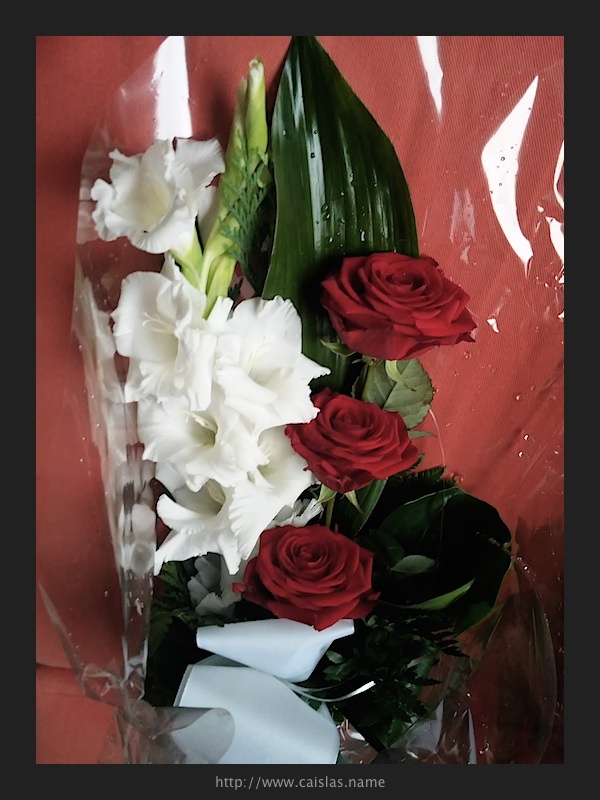 Flowers I got for Outi. She always was elegantly dress, mainly in black and white with a touch of red present. Next we – all the people present at the funeral – were invited to share some moments together on the name of Outi. The tradition, as I read before, is to gather in a house. 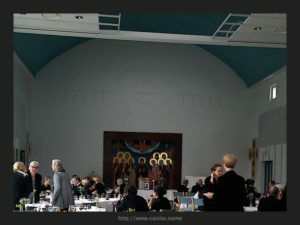 However, in this case we were invited to Joensuu Ortodoksinen Seurakuntasali. Once all the participants were at the specific location the program started. Outi’s godson was the ceremony master and several speeches were given for and about Outi. Outi was a special person and relevant figures came to her funeral. For example speeches came from the Ambassador of France, followed by the academic rector of the UEF, the priest, it was a pianist who played a couple of melodies…. then it was a pause for eating. Afterwards the president of Joensuu’s Rotary Club offered some words followed by the President of Joensuu’s French association and some family members too. Desert was offered and to finalized it was read aloud the condolence cards that were sent to her from all over the world. In between the speeches one was encourage to talk on the tables about our memories with Outi. It was a nice event. For me it was difficult at times to do not clap. You know, after listen to nice words and good memories my inner emotion was to clap, but I needed to keep quiet as the rest of the audience. For me it is still difficult to understand that after a wonderful light that each speech depicted due to the life of someone, we could not join the words with the clap, instead after the speech complete quietness returned bringing me back to the sadness of the current loss. All these was new and strange experience for me. An anecdote comment that I got at the end, is that Outi helped to plan her funeral. I have not question about the possibility that she did. It was so beautiful and perfect, taking care of so many details as she always did with all what it was entrust to her. Outi left a legacy, no only to each one of us who met her, but also to future generations. There will be a foundation Outi Savonlahti to support females from developing countries searching to study their bachelors abroad. 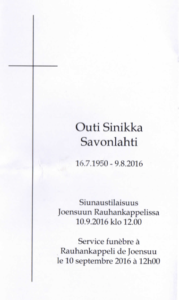 This was my first experience in a Finnish funeral with the departure of a special person. Thank you Outi for teaching me constantly and share moments with me! 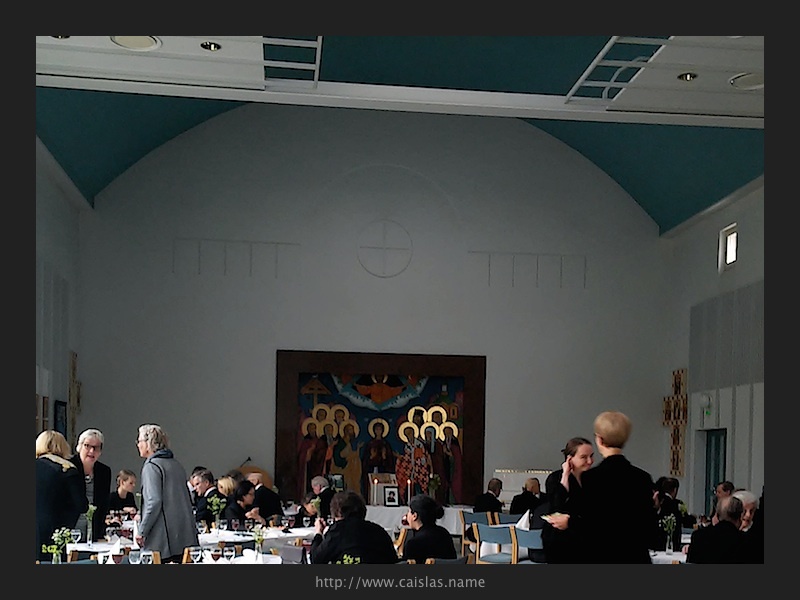 This entry was posted in family & friends and tagged finland, ritual on September 18, 2016 by caislas.